Twitter and Facebook have killed the personal blog. Patcampbell.net is the perfect example. In its heyday (really back when it was musicslave.com), I would post here three to four times a week, and sometimes (rarely) multiple times in a day. I no longer feel the desire to write lengthy (or even short) posts detailing my thoughts about books, movies, religion, politics, my family, dog, etc. Why bother when a.) a 140 character or less tweet will suffice and b.) nobody is going to read anything longer than 140 characters anyway? But my pessimism for the personal blog is not shared by my friend Corrie. She’s relaunching her own personal blog to write about. . . well, pretty much whatever interests her. If anybody still checks in here occasionally, you should check out Linus Hates Me. I think that you’ll find that it’s well written and updated far more frequently than this wasteland. 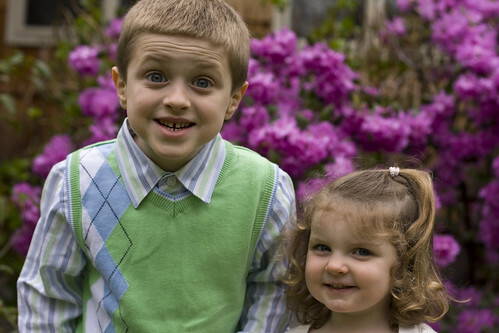 Oh, and here’s a gratuitous picture of my cute kids from Easter. Simon can’t be serious for more than 10 seconds at a time, which makes taking pictures challenging. Aw, thanks for the shoutout Pat. I appreciate it! I find that I enjoy writing, and I write more when I have something to write FOR, even though I don’t necessarily care if anyone actually reads it. Also, congrats on the new Campbell family project! I will read your blog! I don’t get twitter! I still don’t even really understand what it is! Please blog!